As we left Des Moines, we headed south once again on track for Branson, MO. We really enjoyed the rolling hills of western Missouri on our way to Oklahoma in July, so we were looking forward to our trip to Branson. In order to keep our "no more than 5-hour travel day" rule, we had to find a place to overnight. Using our trusty Passport America directory (50% discount at all participating campgrounds), we selected the Outback RV with "Swimming, fishing, boating located 200 ft. from RV sites....100 ft. from Lake of the Ozarks," For some reason, I envisioned a campground with an Aussie theme (the power of word association!). Well, we figured the campground got its name because someone probably said to the bar owner who owned the property, you outta put some campsites "outback," because it consisted of 18 sites the majority with RV's in various stages of disrepair and the empty spaces were overgrown with weeds. :) We did sit out in the evening facing the Lake of the Ozarks watching a beautiful sunset...and just closed the drapes of the motor home to block our view of the cement block foundation of the bar. We knew that Branson was on the edge of the Ozarks, but for some reason we were surprised to find out there were substantial hills to go up and down approaching the city. Following another one of our "rules," we stopped to gas up the motor home before parking it at the campground. What a hoot to see a bus load of Chinese tourists "stretching their legs" by doing line dancing to music being sung in Chinese. Just another one of those fun "quirks" we get to see on the road. This is the mural that Yacov painted after the tragedy of 9-11 when he used his art as an outlet for his grief. He created the painting "America's Heart" including a special message that reflected his belief in the human condition. 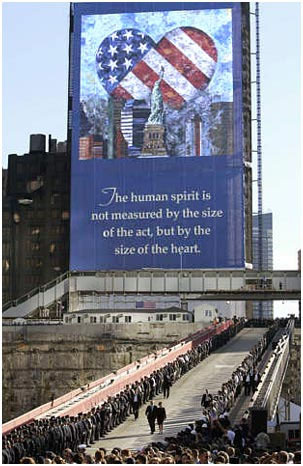 He personally paid $100,000 to have this mural hung on the side of a building at Ground Zero. During intermission, he gave autographs and took time to be photographed with anyone who requested it. When he couldn't accommodate everyone, he promised he would be in the lobby after the show until everyone who wanted had a chance to meet him. At the end of his show, he acknowledged by name every person involved with the production from lighting, to sound, to stage hands. He ended his show philosophically with what I thought was keen insight...the breakdown in a relationship often starts with the loss of shared laughter. It is true, shared laughter seems to be one of the first things that goes in a stale or problematic relationship. I am grateful for the opportunity to learn that there's more than meets the eye when you see a celebrity. We especially liked that it was a combination land and water tour. Our guide described points of interest as we drove by them in Branson, gave us a history of the DUKW, and gave us the history of other military vehicles parked along the private road we were on as we went to the top of a mountain overlooking Table Rock Lake and Branson. The ride on the lake was loads of fun as the captain had the youngsters on the tour maneuver around the Showboat Branson Belle. For a description and service history of this amphibious truck, go to DUKW . Being on the prowl for inexpensive things to do in Branson, we were advised to check out the College of the Ozarks. What a beautiful campus and intriging philosophy. They have created an innovative work program. Not one full-time student pays a penny of tuition. Instead, students work 15 hours each week in a campus job in one of over 80 areas based on the belief and worth of work. On our visit, we found students maintaining the grounds, milking cows, working in the greenhouse, making and canning fruit preserves and fruit cake, running the power plant, working security, and providing guest services at their conference center. The college's mission is to enable students who could otherwise not afford it to get a college education For more information about this unusual liberal arts college, go to College of the Ozarks . Finally, we took a day trip to Eureka Springs, AR...and again it was not at all what I expected. We were intrigued because the entire downtown area of this Victorian town is listed on the National Register of Historic Places (and we wanted to add Arkansas to our travel map of the US). :) When we first drove down the main street, we were disappointed...only a few stores and we thought "big deal!" Lucky for us, we decided to drive up a road at the end of Main Street...and that's where we found the charming town of Eureka Springs. 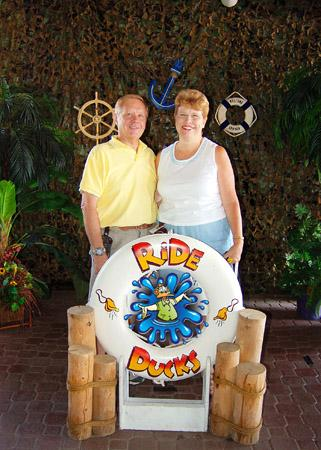 Visitors have been coming to Eureka Springs for a long, long time. Although this Ozark town is known today for its incredible Victorian architecture, arts, antiques and natural beauty, the original attraction was the water. Legend has it that the Native American tribes of the area believed that the cold spring water could cure many ailments, and the surrounding land was considered sacred ground. Victorian-age health-seekers deemed the hills full of miracle cures, and flocked to the area by the thousands, creating a stylish retreat amid the grand, green curves of nature. Pittsburgh has nothing on Eureka Springs when building houses on hillsides. There were houses three high up the hillside (on different roads). An intriguing engineering feat. 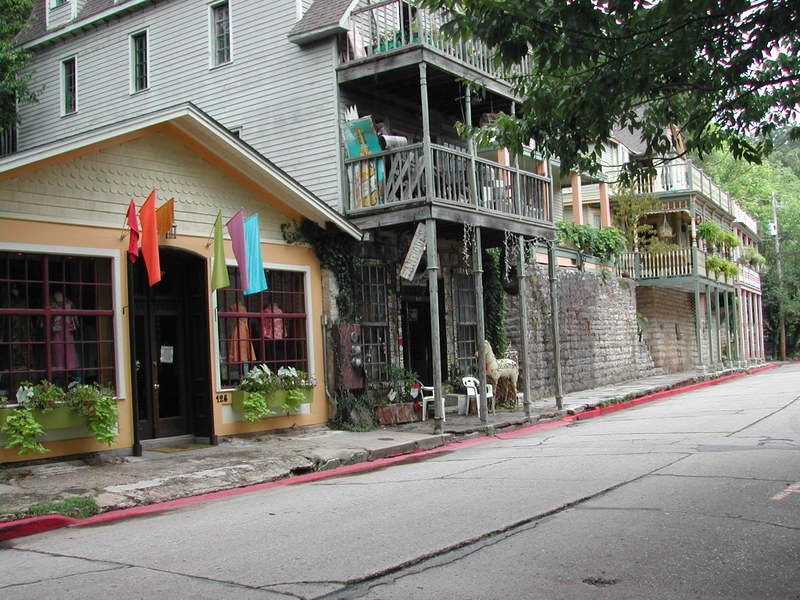 Here is one of the quaint streets in Eureka Springs. To quote Yakov..."What a country!" We are finding that to be very true.